Okay, I don’t usually post in a family-journal kind of way. For me, blogging is just a random, silly outlet that I use to blow off steam when I’m in the mood. (As you can tell by my sporadic postings, I’m a very moody blogger.) 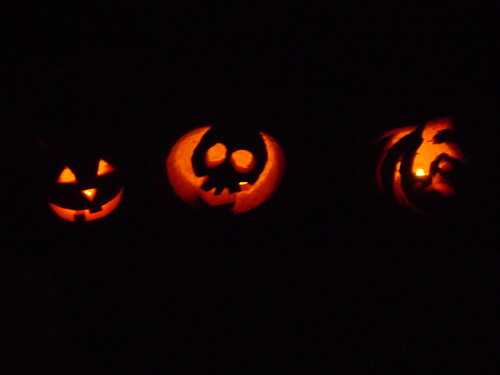 But we just had such a nice October weekend, I’d like to stray from my norm and actually write about what we did. I apologize in advance that you have to read about someone else’s kids doing cute things, but I will be mocking my husband (as usual) so bear with me. Friday night: Three-hour Primary Program practice in the chapel. The only good thing about this is that afterward, the weekend had nowhere to go but up. Saturday morning: 10-mile run with my good friend and running/life mentor, Stephanie. Am I bragging about the 10 miles? You bet. But before you’re too impressed, think of an elephant rumbling down the grasslands of Africa. That’s about how good I looked and felt doing it. Imagine how much better I felt when Stephanie offhandedly informed me that she’d already ran seven miles before I showed up, and then spent the last three miles of our route texting her kids–while running. She was that bored. 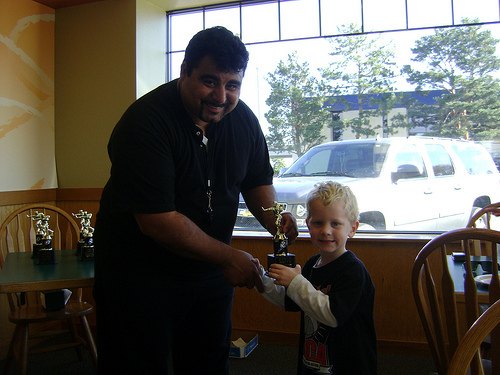 Saturday morning: Ethan’s final “flag football” game (term used loosely) and trophy ceremony/pizza party. Ethan was more excited about the trophy than anything that transpired on the field all season. I am proud to say that my son loves to chase and tackle the other players, just never when or where he’s supposed to. During this last game, I think he finally began to understand that you are supposed to be somewhere in the general vicinity of the football. I consider that a successful season for a four-year old. for people who voluntarily coach four-year olds. 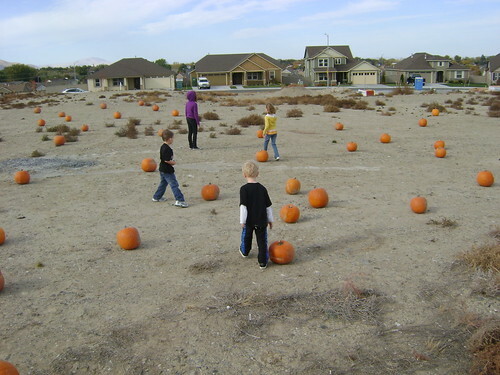 Saturday afternoon: Partook of neighborhood “pumpkin patch.” This is truly hilarious. 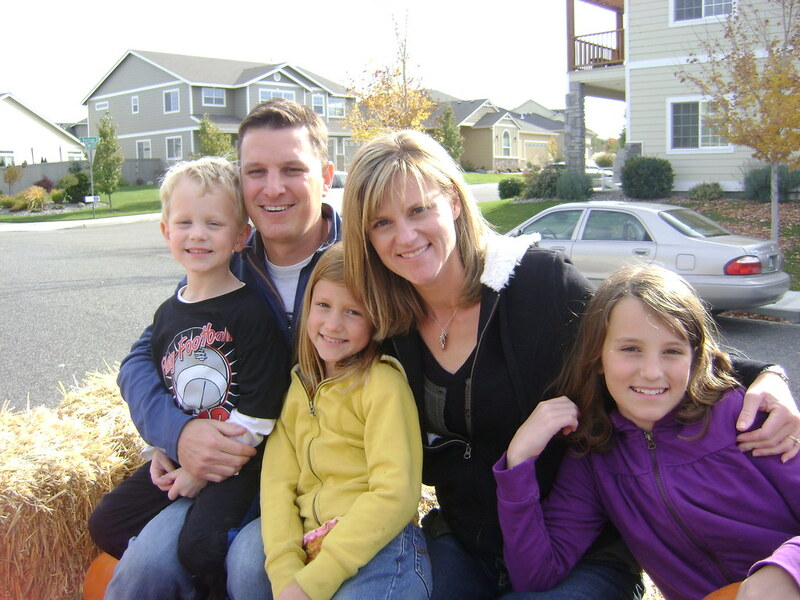 Our HOA scatters a bunch of pumpkins in an empty house lot around the corner, then takes families over on a “tractor”–a golf cart with a bale of hay strapped to the back–to select pumpkins. Afterward we go back to the Welcome Center for lunch, treats and pumpkin painting. My kids absolutely love it, and it saves me a trip to the real pumpkin patch, which I’ve been to nineteen times for school field trips. Have you ever seen such a lush autumnal landscape? “Pumpkin Patch.” See the bale of hay? Authentic, I tell you. Saturday afternoon. Took a rare and much-needed nap w/hubby, then woke before him and read in bed for over an hour–during the day! Can I tell you what a treat this was on a Saturday afternoon, when I usually clean my house or run not-fun errands? Thank you, DVR, for the quality child care that afforded me this blissful opportunity. Read it now. That’s all I will say. Saturday evening: Cleaned up house, got stuff ready for Sunday, dropped the kids at Grandma’s (thank you, Cindy!) then used free movie tix to see yet another Really, Really Bad Movie. Yes, we actually spent two hours viewing All About Steve with Sandra Bullock (it was the only non-animated, non-R-rated option.) 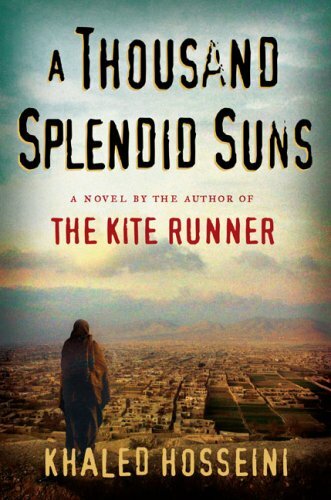 It could not have been lamer, so I will not admit that I sortakinda enjoyed it in a way. There’s just something about Sandra. I know she’s not an Oscar winner, I know her movies are bubble gum, but I still feel like I’m watching an old friend with the big white smile on the screen. And I do think she’s funny. I dare you to rent this, but don’t say I didn’t warn you. And don’t tell anyone you want to impress that you kind of liked it, which I know you kind of will. Sunday morning: The Big Show. My kids thought they were debuting on Broadway (not that we like to make things all about us.) The planning/practicing/kid-herding for this annual event has loomed over my (and many others’) head(s) for some time, and through what can only be described as divine intervention, it went off without a hitch. I’d even say it was beautiful, especially when my little ladies performed. Rachael played lovely prelude music on the piano, and Megan played a lovely solo (Teach Me to Walk) on her violin. Even Ethan knew all the words to the songs and sang them with…let’s just call it gusto. Suffice it to say that nobody in the congregation could miss Ethan Smith’s performance up on the stand. As an ironic bonus, he was seated next to the Bishop for the entire meeting. Sometimes I wish video cameras were allowed in church. Sunday afternoon: Wonderful home teachers visit with a nice message, save one hiccup: they brought a large, clear jar of colorful m&ms; and set it on the coffee table before us. We all stared longingly while pretending to listen to said message. Afterward, we were ready to dive in when our usually kind home teacher informed us that we could only have one m&m; every time we did an act of service. He’d even written “Service Jar” on the glass with permanent marker. Was he kidding? As soon as he left, we started backlogging everything we’d done in the last few weeks that could qualify as service: housework, churchwork, homework, ab-work. We rewarded ourselves amply. No injuries: My knee miraculously healed, and I ran like a dream. I felt fantastic the whole way, except for the last two miles when my body decided it was done. 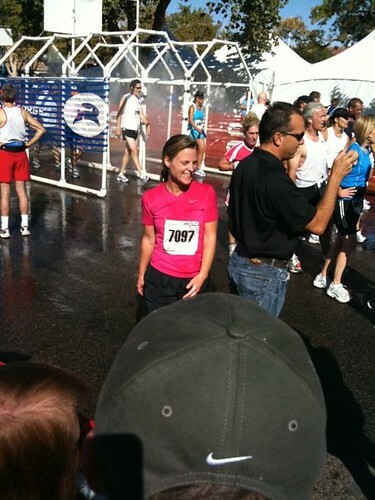 I pushed through it, though, and finished with a smile. I was so excited! Perfect weather and unparalleled scenery. Anyone who’s been to Southern Utah knows that the world turns pink when the sun comes up, which is when we started our run. We had front row seats to the desert’s best. Breathtaking. Accomodating staff: Maybe I was just a doe-eyed newbie, but boy, did it feel like we were in good hands. The runners were provided with water, gatorade, fruit, power bars, muscle cream, vaseline, and even goo along the way (although that was more of a punishment–imagine having your throat injected with a cup of rotten caramel while you’re panting for air). We were met at the finish line with misters, medals, flowers (if your husband’s as sweet as mine), and a parkful of free goodies. Who said Real Runners were healthy eaters? Everyone went straight for the free soda and ice cream. That’s when I knew I was among friends. Good–no, great–company: In addition to the thrill of running the race, I got to do it with my good friend, Wendy Sunderlage, whom I haven’t seen in years, and her sister Kerry and good friend April. What a fun and encouraging group of gals to sweat with! We talked and laughed and almost cried together. Wendy’s sister provided us a huge, lovely home to stay the weekend in with enough beds for everyone–the most important thing pre-race! Her parents were also in town and were so generous, cooking for us and helping us get ready. After the race we showered and layed around for awhile, then went to “Five Guys” burger joint for dinner. Either it was the post-race appetite or that was about the tastiest hamburger I’ve ever had. 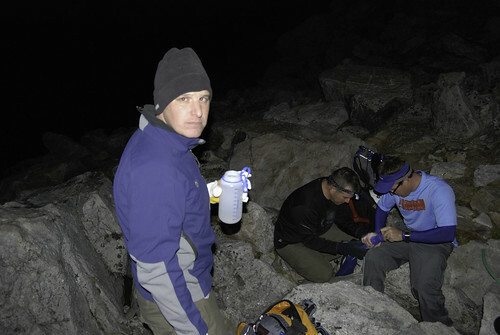 Wendy’s husband, Rob, is a good friend of ours, too, and does alot of climbing with Derrick. Laughing and hanging out with these generous, funny friends was as meaningful as finishing the race. I’m so glad we’ve kept it touch over the years. I was scared silly about this whole thing but, as everyone who’s ever run a marathon promised me I would, I now just feel giddy. And grateful. I feel thankful, thankful, blessed and lucky and thankful: for health and strength and dear friends and red rock and no blisters and misters and free ice cream and hot showers. But mostly for my husband, who’s listened to me obsess over this for weeks and has not only endured it, but has treated me like royalty through the entire experience. And, yes, I’m also thankful that it’s over. Now you don’t have to hear about it anymore, and I can go back to blogging about the things I do best: watching bad movies and forgetting important stuff. No posing there!